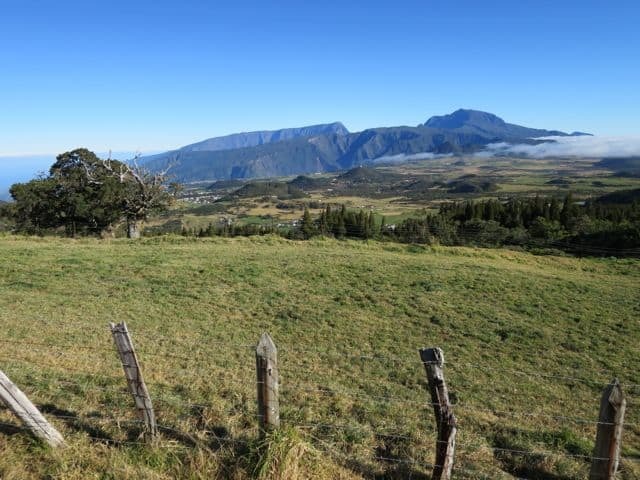 The mountainous interior of Réunion Island. Réunion Island is a volcanic island off the coast of Madagascar in the Indian Ocean, just 200km southwest of Mauritius (map). An overseas department of France, Réunion is the outermost region of the European Union. French is the official language and the Euro is the currency used. Formed by millions of years of volcanic activity, Reunion is a mountainous island with dramatic peaks at its core and gradually descending slopes that end in the depths of the Indian Ocean. It’s an island of stunning contrasts; from tranquil lagoons to craggy peaks, and savannah landscapes to tropical forests. Its population, a mix of French, Creole and Asian, is warm and hospitable – in fact, their big smiles and relaxed attitude are the first things any visitor will notice. I spent an incredible week on Reunion exploring its coast and spectacular interior, tasting its lovely cuisines (and delicious rhum) and mingling with some of the friendliest people in the Indian Ocean. My mind is still spinning from so many amazing experiences so I’ve decided to introduce this island to you via an Instagram tour of Reunion, and help my brain process all those impressions. These are photos posted by me and my blogger friends during our one-week visit. Hope you enjoy the tour as much as we did! I arrived in Réunion after an 11-hour flight on Air Austral from Paris. Air Austral is based at Réunion’s Roland Garros Airport and flies with modern Boeing 777 and 737 aircraft serving Paris, Johannesburg and other destinations in the Indian Ocean, Africa and Asia. They offer three classes: Loisirs (Economy), Confort (Premium Economy) and Club Austral (Business Class). I flew in their Confort Class and enjoyed more legroom, great service and a choice of food and wines, not to mention champagne as a welcome drink. Air Austral gets a thumbs-up from me for their friendly service (with a smile) and terrific food! My first stop was Saint Denis, the capital of Réunion. Hemmed in between the mountains and the ocean, Saint Denis is famed for its gorgeous architecture (the compilation photo below shows the City Hall), villas and edgy street art. From here, we continued on to the lagoon at l’Ermitage les Bains on Réunion’s west coast where we enjoyed a grilled swordfish lunch, local Bourbon beer (more popularly known as Dodo) and awesome views of the crystalline lagoon and white, sandy beach. As we tucked into lunch, we noticed whales breaching the surface in the distance. What a special welcome! 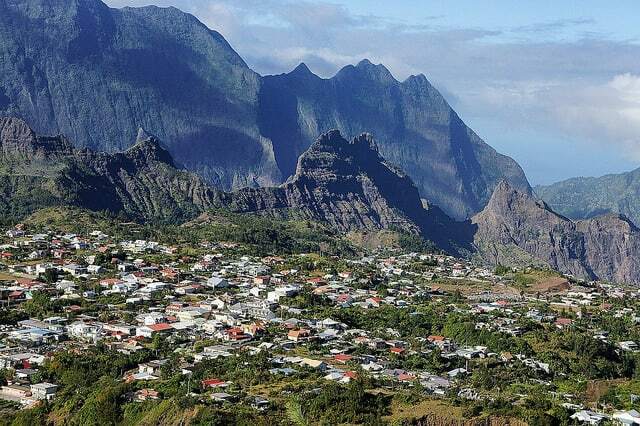 Our exploration of Réunion began with a drive along the south coast and up into the mountains. The scenery along the way was just spectacular! The highest peak in the distance is the Piton des Neiges, at 3,070m, Réunion’s highest mountain. We reached the Plaine des Sables, a plain at the edge of the island’s active volcano, Piton de la Fournaise. The Mars-like landscapes were astounding. We continued our drive to the northwest coast where we headed south again along the lava-covered shores. A huge section of the southeast coast is kept free of settlements as this is where the lava flows with each eruption. We stopped here to check out the lava flows and went on a fascinating walk with our expert guides from Aparksa Montagne through a lava tube formed during an eruption in 2004. It was warm and humid, and the formations on the walls and ceiling were extraordinary! Definitely not for those who suffer from claustrophobia, the walk through the lava tube was a wondrous experience. The next day, we visited the town of St. Pierre, with its lively Saturday market. It’s a great place to taste local specialties like Bon Bon Piment and a variety of rhum, buy top quality vanilla (Réunion produces some of the best quality vanilla in the world) and pick up some souvenirs. Our next stop was the black sand beach of L’Etang Salé and La Pointe au Sel, further up the west coast. The little lagoons and rocky coast formed by ancient lava flows were especially striking. We went on a whale-watching trip the following day on board Hnoss, an old fishing sailboat. We were accompanied by scientists from the Dare Win program, whose aim is to study the acoustics and ethology of whales and dolphins. We didn’t get to see any whales that day, unfortunately, but we did get to see lots of Spinner dolphins! And lying in that hammock above the deep blue ocean was just fabulous! That evening, we were treated to a gorgeous sunset dinner at Coco Beach in La Saline les-Bains (on the west coast). The sunset was dramatic, and with our toes tucked into the sand, we enjoyed a terrific local tapas-style dinner and listened to the funky tunes of a local band. The next day, we embarked on a stunning trip into Cirque de Mafate, one of three ‘cirques’ (circular sections of an ancient caldera, with towering walls and jagged peaks forming a frame around each circle) with our guide Ludo. The trip started with a 4-wheel-drive across the Riviere des Galets (or the ‘People’s River’). The trip continued with a 3-hour hike through the canyon. The scenery was just mind-blowing! Walking through lush forests and across the gushing river, we were constantly accompanied by the imposing walls (hundreds of meters high) and daunting peaks of the cirque. We soon reached the colourful village of Cayenne, deep inside the Cirque de Mafate. There are no roads into this cirque so the only way people have access to the coastal towns is either on foot or by helicopter. We were greeted warmly by the inhabitants and were treated to a fabulous Creole lunch. After lunch, we were picked up by a helicopter, courtesy of Helilagon (who also offer various helicopter tours). Weaving through the canyons and past misty peaks, I was just blown away by the amazing scenery! We had another adventure-filled day as we went canyoning with Run Aventures down the Riviere de Roche from Bassin la Mer to the Bassin la Paix on the northeast coast near the town of St. Benoit. An old lava flow had been carved into a canyon by the river, with astonishing walls on each side, tranquil pools followed by rapids and waterfalls. It was another incredible experience, jumping off the walls (some up to 12 meters high) into the pool below, tobogganing from one pool to the next or floating down the river. My pal Matt went kayaking down the rapids! Not for me but it sure looked spectacular! In the evening, we attended a dinner party where we got to witness stunning performances by a méringue troupe (méringue is a local martial arts dance somewhat similar to capoeira that can be found in Brazil) and the lovely Mahoya dancers. There was one more adventure in store for us: a micro-light flight across the island with Felix ULM. This was certainly the most mind-blowing experience as we got to see the island’s spectacular topography from above. The views were just incredible! 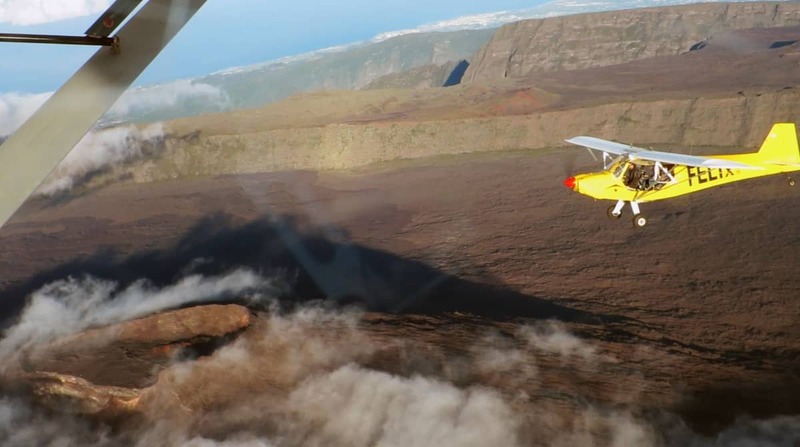 The pilot flew me across the impressive peak of Piton des Neiges (the highest peak), the three cirques with their villages, forests and waterfalls, to the volcano (Piton de la Fournaise) and past the lagoons where we spotted large pods of dolphins. I spent my last day on the island chilling at the gorgeous Lodge Roche Tamarin. Set amidst a dense jungle, the lodge comprises spacious wooden bungalows connected by wooden walkways, a beautiful spa and an excellent restaurant. After a week full of adventures, I indulged myself with an afternoon in the spa and a terrific massage. Réunion was absolutely spectacular! I wouldn’t know how else to describe it. The island is a paradise for nature lovers and those seeking an active or adventure holiday. The imposing peaks, cirques, multitude of micro-climates and landscapes, the stunning emerald lagoons and the lovely people will leave an unforgettable impression on anyone visiting this island in the Indian Ocean. A big thank you goes to Nicholas from Tours Reunion who was our guide and driver during our week on Réunion. His knowledge of the island and enthusiasm made our stay truly special! Nice, I’ve heard that name Reunion, but never had a chance to explore more about it. I am just fascinated by these remote islands situated in the midst of the world’s great oceans. Thanks for introducing Reunion to me and everybody else! You’ll LOVE Reunion Island! I was just blown away by its stunning beauty. I am actually planning to stop by Reunion Island and spend a full week trekking EVERYWHERE! I am French and have many friends living there. They were constantly teasing me with all the great landscapes and nature there…this year will THE year. What an amazing and entrancing read, I believe it’s wonderful people like yourself who inspire others and create insight into seemingly unknown detonations of beauty. Thanks for sharing, I look forward to your next post. What an incredible diversity of landscape on one island! Reunion sure has a wealth of natural and cultural assets. I’m intrigued by the market photos. Would love to hear more about the cuisine!